The Innocence of Muslims is truly the free speech story that keeps on giving. The crude, cheaply made anti-Islam film sparked international outrage when it first appeared on YouTube in September 2012, with even President Obama forced to weigh into the debate after the US Embassy in Cairo issued a tweet “condemning” the video. While ostensibly supporting free speech, the White House did suggest that Google should examine whether the video contravened its own terms of service. Google eventually blocked the video of its own accord in Libya and Egypt. Meanwhile, in its move to censor the film, Pakistan simply blocked the whole of YouTube. Now, a US court has ruled that Google should remove the video from YouTube. Not because of blasphemy, but because of copyright. The case against Google and the makers of the film was brought by actress Cindy Lee Garcia, who appears in the film for all of five seconds. Garcia claims that her single line, suggesting that Muhammad was a “child molester” was dubbed, and that she was duped into appearing in the anti-Muslim film, having been told it was a trailer for an adventure movie. Crucially, she also says that she has a claim to the copyright of the film. The Ninth Circuit Court of Appeals agreed that she may have a claim, and on 19 February ordered Google to remove the film from its YouTube service. Google has said it will appeal the order, saying that not only could the copyright claim of a bit-part actor create havoc for filmmakers of the future, but that service providers could now also be swamped with takedown requests from people who regret appearing in works in the public domain. Interestingly, it also suggests that the simple removal of the video could constitute a tampering with the historical record. That chimes with an argument Index has made before – we seem far more comfortable with the removal of web content than we do with, say, the pulping of books, even though the intent is the same. 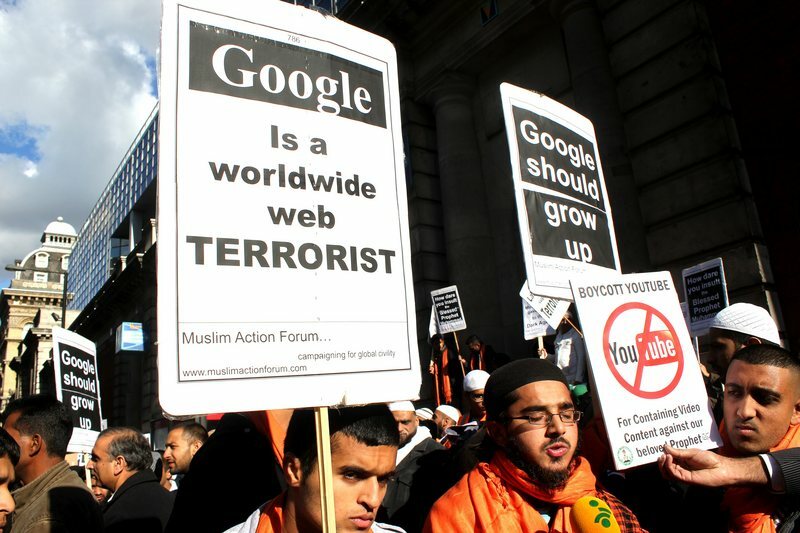 As things stand, Google has complied with the order, and the Innocence of Muslims can no longer be found on YouTube. In yet another twist, Pakistani web freedom campaigner and Index on Censorship award nominee Shahzad Ahmed has used the removal of the video to pressure his government to lift the YouTube ban. Padraig Reidy is the editor of Little Atoms and a columnist for Index on Censorship. He has also written for The Observer, The Guardian, and The Irish Times. I agree to receive the Index on Censorship weekly newsletter, monthly events newsletter and periodic campaign updates via email.